∫ Annual block party, South William Street, Johnstown, 6 to 11 p.m. Our Secret Love Society and J.D. Aldrich will be playing. ∫ Doc Orloff Blues Elixir: Riverfest, Riverlink Park, Amsterdam, 2:30 p.m.
∫ Linda Lee and the Fox Creek Band with special guest Les Martin: Pawling Hall, 86 N. Pawling St., Hagaman, 4 p.m. $10 cover. ∫ RandallPalooza: The Outlet, 2401 State Route 10, Caroga Lake, noon. All ages free admission. The bands include Andrew Kuder acoustic, No Limit, Cleen Street, The Vinny Michael’s Band, Dealt the Blues and DJ Drew and DJ G.
∫ Doc Orloff Blues Elixir: Sport Island Pub and Restaurant, 108 Riverside Blvd., Northville, 2 p.m. No cover. ∫ “Fun with Pool Noodles” — a family craft program: Gloversville Public Library, 34 W. Fulton St., Gloversville, 1 p.m. This event is sponsored by the Capital District Child Care Council. ∫ Libraries Rock art program for children — The Tang Museum: Gloversville Public Library, 34 W. Fulton St., Gloversville, 2 p.m.
∫ Gloversville Civic Band — “Music through the ages”: Gloversville Public Library, 34 W. Fulton St., Gloversville, 5:30 p.m. Free. ∫ “In-LawFully Yours” with Marilu Henner and Corbin Bernsen: The North Country Bible Fellowship, 132 Elm Lake Road, Speculator, 7 p.m. Free movie, popcorn, beverages and snacks. ∫ MaryJean Cleland and Maria Simone — organic convergence welcome reception: Caroga Historical Museum, 145 London Bridge Road, Caroga Lake, 7 to 9 p.m. The exhibit runs through Aug. 26. ∫ Sam Whedon and The Unbelievers — Johnstown Midsummer Concert Series: Charles Jenner Bandshell, West Main Street, Johnstown, 7 p.m. In case of rain, the show will take place inside St. John’s Episcopal Church, next to bandshell. ∫ Legend — Classic Rock Band: Patricia’s, 32 S. Perry St., Johnstown, 10 p.m. No cover. ∫ Third Rail: Wells Old Home Days, Wells, 8 p.m. No cover. ∫ Doc Orloff Trio: Old Trail Inn, 232 N. Shore Road, Edinburg, 8 p.m.
∫ No Limit: Gloversville Moose, 140 E. State St., Gloversville, 8 p.m. All are welcome — open to the public. No cover. ∫ The Reservoir band: Sport Island Pub and Restaurant, 108 Riverside Blvd., Northville, 9 p.m. $5 cover. 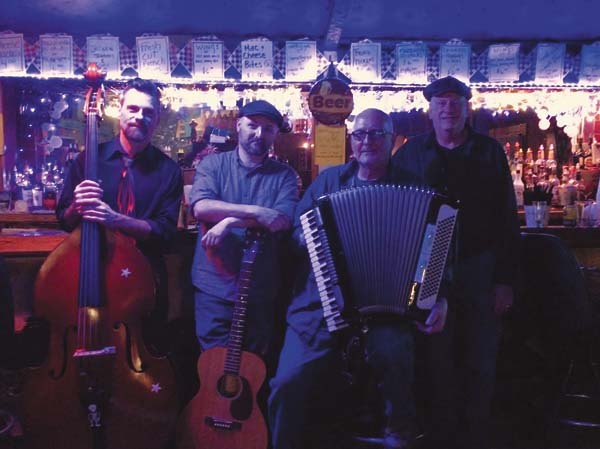 ∫ The Lustre Kings: Village marina, St. Johnsville, 6:30 to 8:30 p.m. Free to public. ∫ Nancy Purcell — “Those were the Days”: Caroga Chapel, 106 Chapel Road, Caroga Lake, 7 p.m. Free. Rodeo: Paradise Ranch, 3124 Route 29A, Caroga Lake. The cost is $10 per person; $5 for ages 7 to 12; and free for children under age 7. The rodeo will feature bull riding, barrel racing, break-away roping, sheep riding, dollar catch, chute dropping and banana eating contest. For more information, call (518) 848-9534. ∫ Caroga Lake Music Festival: The Glove Performing Arts Center, 42 N. Main St., Gloversville, 7 p.m. This is a free concert — donations will be accepted. Concession and wine will be available for sale. Doors will open at 6:30 p.m.
∫ Disney’s 101 Dalmatians KIDS: Glove Performing Arts Center, 42 N. Main St., Gloversville. General admission is $10 for adults; $8 for students and seniors. Tickets are available at the box office by calling (518) 773-8255, Ext. 25 to reserve tickets. Online tickets are available on the theater’s website at www.glovetheatre.com. The show will begin Friday at 7 p.m. There will be two shows on Saturday at 4 and 7 p.m. Sunday’s showtime is 2 p.m.